Somnambulant Gamer: You Might Know Jack, But How About Max? You Might Know Jack, But How About Max? You Don't Know Jack, the wry absurd trivia franchise has seen many incarnations since it's first iteration way back in the ancient days of 1995. Back then it was a delightful spin on a very tired trivia game genre. Since then it has seen not just many more volumes of the PC game, but a webisode version (very like an interactive "Wait, Wait, Don't Tell Me"), a short lived television show, a social Facebook edition, a mobile app, and recently as a launch title on the OUYA. The You Don't Know Jack series by Jellyvision Games (now Jackbox) are a nostalgic heavy hitter for me. My first memories of playing the original are in 1996 huddled around a keyboard, family members jostling for their buzzer keys, laughing out loud at the quirky questions. It was my first "multiplayer" experience if you will. It's humor and ability to bring my family together around the computer gave it a special place in my heart, and over the years I would check up on Jellyvision to see what the franchise was up to. Jellyvision Labs (which shares founder Harry Gottlieb with Jackbox Games) most recent venture is an new interactive mini-game within Netflix called Max (currently only available on the PS3). Max is the answer to many a Netflix subscriber's prayers, in that it helps you decide what to watch. Netflix can often be too much of a good thing, with the question of what to select for an evenings viewing ending in despairing indecision, a now common consequence of being so spoiled for choice. "Max" is a helpful commentator that guides you through some simple, entertaining, and light game styled questionnaires to help you pinpoint what you would like to watch on Netflix in that moment. Max has many of the familiar markers of a YDKJ game, a friendly fourth-wall breaking disembodied narrator, cartoon-ish sound effects, and quirkily named categories. I have tried Max several times now and I have been quite satisfied and entertained with the suggestions that "he" has offered. My husband less so, but he has not taken the time to flesh out the ratings of his profile yet, a crucial building block for Max to function properly. 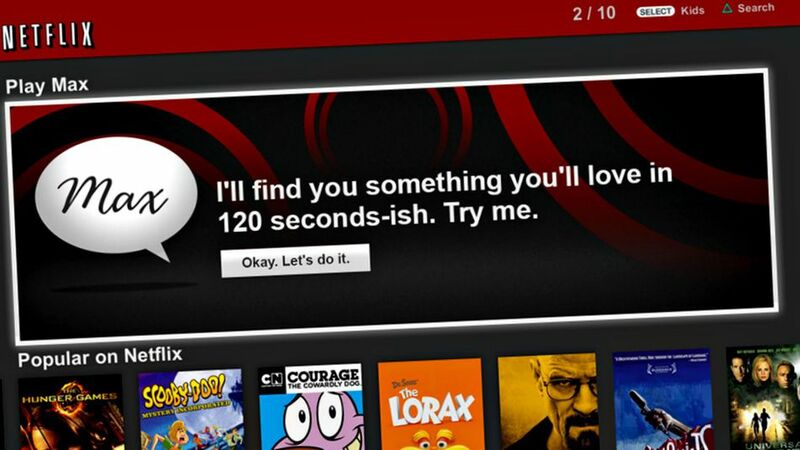 If you are a Netflix customer I would highly recommend taking it out for a spin. I am sad to say that it doesn't appear that either Jellyvision Labs or Jackbox are going to introduce an in app version of YDKJ to Netflix, which I for one would love to see. I wouldn't entirely rule it out as a possibility though. If YDKJ's history of variations is any indication, we may see something like it soon.